Comparing ourselves with others is part of human nature, and it can be helpful to push us to tackle the hard work that’s needed to improve. I’m often asked if the conversion numbers and benchmarks that I shared the previous year are still the same. With the constant change in the world of online sales and marketing, how do those benchmarks stand the test of time? Let’s look at the numbers and see how they’ve evolved over the past five years. Builders, I encourage you to cross-check your own conversion rates to see where you stand. As you diagnose each part of the funnel, you may find opportunities to create more sales. OK, who’s ready for some math? We have reached full power, captain. Even if a home shopper finds the home they’re looking for via traditional methods (referral, drive-by, sign, real estate agent), they still leverage online tools—social media, customer reviews, news articles—to gather research and support a more informed decision. Equally important, other co-shoppers around them will use those online tools as well. One hundred percent of buyers are influenced by the internet and online tools today. You need more than just a website because those buyers are looking everywhere. Every lead has value, no matter the source. Most builders fail to track phone calls from online sources. Use a tool such as CallRail.com. This is the first change we’ve seen with established programs. Twenty percent used to be the conversion target. Now the conversion target for appointments should be 25 percent to 30 percent +. As the natural starting point for customers shifts online, the top of the funnel grows larger, with greater lead quality and quantity, which means your appointment conversions should follow suit. As lead quantity and quality grow, so should your appointment conversion rates. A skilled online sales specialist is essential to manage these leads and more effectively convert them to appointments. 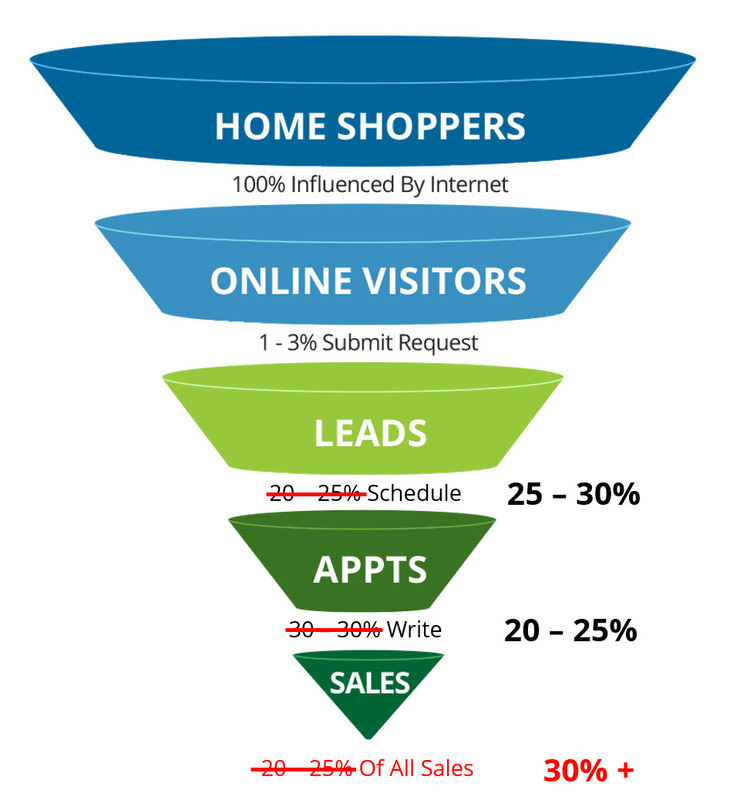 Adding more leads but managing them poorly won’t create higher conversion rates. Set your starting target at 20 percent conversion for new online sales programs and at 30 percent for established programs. Online leads that become appointments are two to three times more likely to convert to a sale than walk-in customers. On-site traffic is lower, but online appointments are naturally picking up the slack. The handoff from online to on site must be seamless or you will lose momentum with a prospect, so you must have a skilled online sales specialist to finesse this shift. Benchmarking only includes prospects that set and keep a physical appointment, not leads in the system that go out on their own. This factor is a natural shift of the online consumer. If you aren’t seeing numbers as high as this, your prospects may not be seeing you online, or there’s a breakdown in the process. The goal is to accelerate the sales process and follow up immediately and completely with 100 percent of prospects. Use these benchmarks to diagnose your program and reverse-engineer your numbers to eliminate roadblocks. For example, you may not be generating enough leads for the size of your company. You’ll want to make sure online traffic is high enough and your calls to action on the website are clear, compelling, and prevalent. Maybe you have enough leads, but conversions to appointments are low. Review response time and the follow-up process. Ensure the phone is being answered promptly and professionally and that your people respond to leads within 5 minutes during business hours. Also, review the conversations, both over email and phone. Are you asking the right questions and encouraging prospects to set appointments? If you have leads and appointments but the sales don’t add up, the first thing to review is the hand-off process from online to on-site. This is the Achilles’ heel for many online sales programs. No matter how good you are at engaging leads and setting appointments, if you don’t transfer that energy and momentum to the on-site team, the sales won’t follow. Your sales team must be educated on the value of that appointment. They must understand that this customer becomes theirs the second the hand-off occurs—not when they reach out to the prospect or show up at the appointment; it’s the instant the salesperson receives the lead’s information. This mindset shift can instantly improve the conversion of appointment to sale. The final question to ask is: Are you following up after the appointment? Remember, you engaged this prospect earlier and set an appointment sooner, but they may be at the beginning of their search and not the end. You must persist past two weeks and even two months. Keep the faith and keep in touch with those online buyers. Do you know your numbers? It’s difficult to benchmark if you aren’t tracking these key metrics for the online sales program. Start today if you haven’t been monitoring the results. Remember that improvement comes over time, and even a few percentage points in the right direction make a huge difference in the number of sales created. We expect online engagement and sales from online shoppers will continue to increase. If you treat them right and exceed their expectations, the end result will be more sales.